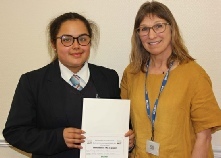 Emily was presented with a certificate and the prize of £15 by TAM’s education officer, Lorraine Davies, and Emmanuel Jaffré, the president (chair) of Hennebont Jumelage (twinning association) during a visit by the pair to Bishop Vaughan to discuss possible links between the school and a partner school in Hennebont. The photograph (left) shows Emily with Lorraine. The second Mumboules Competition at Southend Gardens will take place on September 1st, starting at 9.30 am. MCC are supporting this event and TAM put in a team last year. Tonia Antoniazzi, our MP and also Honorary Vice-President of TAM, would very much like to join an MCC or joint MCC/TAM team. We need 6 members per team, so if we can only get 11 or less interested, it will have to be a joint team. But if we can get 6 from each organisation, we can put 2 teams in. New Mumbles twin town in Maryland, USA? TAM and our twinning partner MCC have been jointly approached for a possible new twinning link by the mayor of Havre de Grace, Maryland, USA. The town is at the mouth of the Susquehanna River where it enters Chesapeake Bay. Representatives of TAM recently held a very positive fact-finding meeting with two residents of Havre de Grace who have longstanding family links with Mumbles. The outcome was a question-and-answer report (their anwers, to our questions), which we passed on to MCC to be considered at their next full council meeting. The members of TAM in a full general meeting on 20 June welcomed this interesting initiative. They authorised the Executive Committee to engage fully in discussions with MCC and Havre de Grace. Click here to find out a lot more about Havre de Grace in our report to MCC. We are a bit late in getting organised but there are places left for teams if we get the team(s) registered ASAP! Each team member has to raise £25 for charity through donations or sponsorship. The charities are Tenovus and the Lord Mayor's Charities. 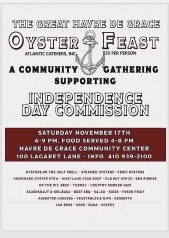 Havre de Grace, like Mumbles, has an annual oyster festival.